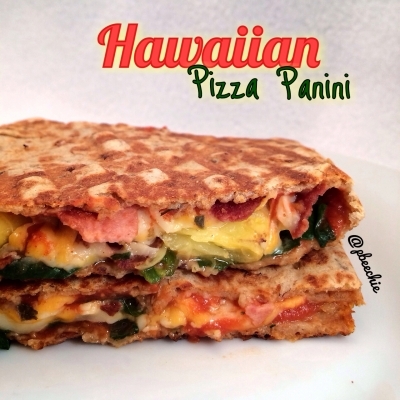 When you can't decide between pizza and an amazing sandwich, why not both! Mix the tomato sauce and garlic bread seasoning. Spread it on the flatbread half. Add a handful of spinach onto the sauce. Then cook your turkey bacon. Chop the bacon into pieces and put it on the spinach. You could use ham instead of turkey bacon. Also place chopped pineapple and shredded cheese. Fold in half and place in a panini press until lightly browned.